A teen girl's room was outfitted with colorful bohemian elements and antique white furniture inspired by Queen Anne style. Fuchsia, teal, apricot and gold--together at last! This teen girl's bedroom color palette expresses her youth and energy. A vintage hobnail glass vase sits among fine art works by Renae Barnard and Melissa Halozan on the teen girl's bedroom nightstand. The textured chartreuse throw pops against the teal bedding. Handmade draperies are banded with colorful embroidery in shades of fuchsia, teal, chartreuse and gold. 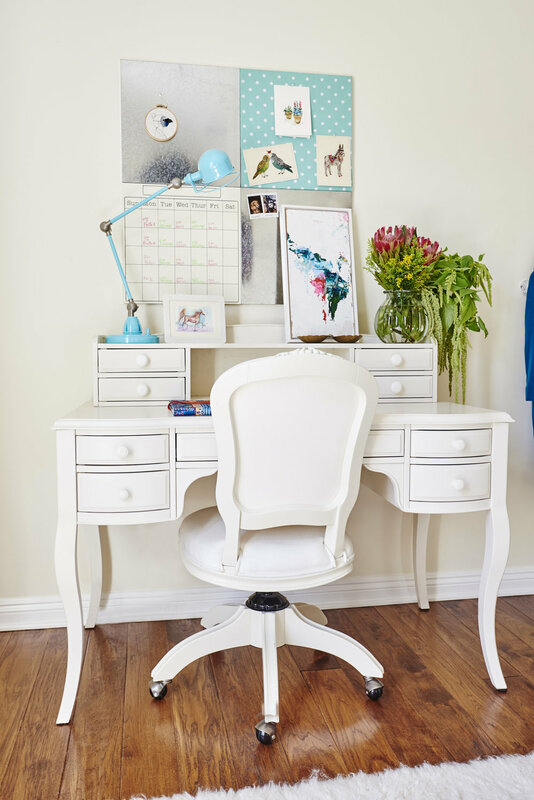 A desk chair inspired by Queen Anne style pairs perfectly with a vintage inspired desk in a creamy white finish. An articulating desk lamp adds a pop of aqua to the teen girl's study area. Vibrant protea flowers are paired with draping amaranthus and an oil painting by Allie Ihm.